Since 4 Pics 1 Word levels are random, please insert the number of letters in the answer and the list of available letters available. We will show you a list of images, click on the image of the level to get the right answer. Use next button to view more images. Are you stuck on a brain baking level of 4 Pics 1 Word? Use our answer search engine for 4 Pics 1 Word and win! It’s a word finder and a 4 Pics 1 Word cheat dictionary, ready to take any letters you’ve got, match the word length you want, and deliver a list of 4 Pics 1 Word images that compare with the one the game shows you. It couldn’t be easier. Just choose the right word length and type your letters in the box. 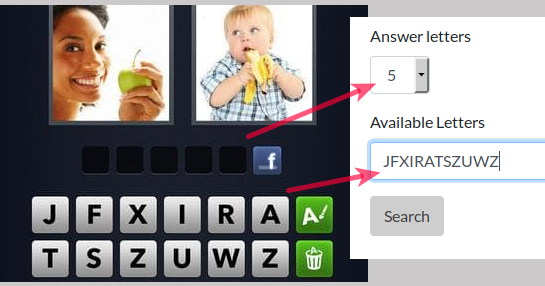 Our 4 Pics 1 Word magic answers database will do its magic and you get a list of possible levels. Just chose the image that match the one you see, and you get your answer! Simple as that! Word Finder’s 4 Pics 1 Word helper is built to help you proceed when you are stuck on a level. It’s not just a word list or a scrabble dictionary, it is tailored on 4 Pics 1 Word and frequently updated to get you the answer for your puzzle. 4 Pics 1 Word is the most famous guess the word from the pictures game. It counts millions of fans everywhere in the world. This game is developed by LOTUM GmbH and was originally only available for Android devices. Now it has been ported to iPhone and iPad too. Playing this game is easy and relaxing: just look at the pics it shows and try to guess an hidden word. That's it! Looks easy, but it isn't: sometimes guessing the right word requires deep and lateral thinking. 4 Pics 1 Word is tough game. And the worst is that 4 Pics 1 Word is never the same: when you download 4 Pics 1 Word on your device, the levels are randomly assigned, so each game is different. That means you can't search by level number to find an answer. We suggest to browse this site for the number of letters in the solution to find the image you are stuck on. You can also use the search box typing some word to describe the image you see. Our search engine is optimized to help you find the right image. Find here all the 4 Pics 1 Word Answers you need!